Mathematics and Computer Science CRAI Library provides comprehensive materials for teaching and research activities at the Faculty for the courses: Mathematics and Computer Engineering. 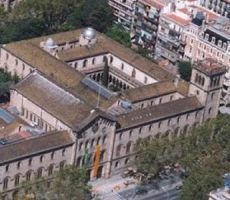 It is also used by researchers at the University of Barcelona Institute of Mathematics (IMUB). It is a founding member of Documat. The library inherited collections from the mathematics section of the former Faculty of Science and the later Mathematics Seminary. It has a notable early collection on mathematics (1821-1945), with works by the most representative authors from the nineteenth and twentieth centuries: Fourier, Lagrange, Poincaré, Rey Pastor, Puig Adam, etc. On the Mathematics CRAI Library in blog (Bimonthly news of monographs and journals) and Catalogue.